Amelia Avila Garcia is waiting near the front desk of Bladium, the popular sports and fitness club located at the former naval base in Alameda. Earlier in the day, she taught back-to-back classes. She had time to unwind, if only briefly, before another grueling session of two more classes. This sentiment is common among the members. Garcia has been the Group Fitness Manager of the sports club for the past eleven years. 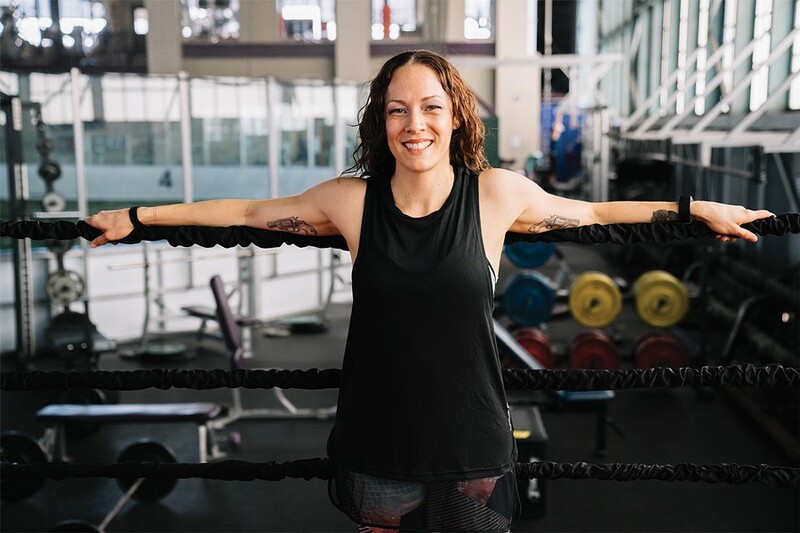 Since joining, she has transformed the lives of countless of individuals, some perhaps initially intimidated at the thought of working out, but who found a safe heaven and a sense of community at Bladium. Garcia’s commitment to fitness began when she was young. As a child athlete, she was always involved in sports. Her father was an avid runner, and her mother did step-aerobics. “I’ve always loved being physically active, but never liked the pressure of being competitive,” Garcia recalled. It was actually those workouts with her mom that fostered her desire to become an instructor. As a college student at Humboldt State, she did just that, obtaining her certification to teach step-aerobics, and even teaching classes during her time as an undergrad. Garcia’s style of teaching, and her devotion to fitness and desire help people get fit, has even converted members of the club into instructors. “You gotta love what you do, and it will automatically inspire people,” she said. Garcia’s “regulars” show up for every class, and often settle into their favorite spot inside the room, equipment ready to go. Garcia says that fitness should make you feel good, even if it is just a mental release, and a boost of confidence. But she also understands the struggle to find the time to work out; she is also a mom of two — a toddler and a six-month baby girl — and also a wife. Garcia’s forged a community bond at Bladium. Since her tenure began, she has made sure that members feel comfortable, and actually want to come back and become regulars. Her reach goes beyond the hours at the sports club; she uses Facebook to keep in touch with members, and shares tips not only for fitness, but also about healthy eating habits, too. Have a question about a fitness tracker? Garcia has plenty of answers. Need a quick workout routine to try on your own? She’ll even film one for you. “I want our [Bladium] family to continue to grow, make sure that new people feel comfortable, and find something they like about fitness,” she explained.